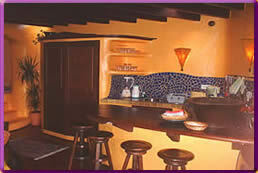 Finca Villa "Casa de Niro" Here you find a very interesting and orthodox vacation home. to a very beautifully reconditioned old Finca. 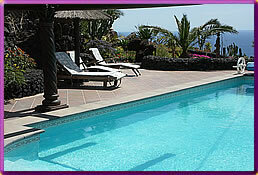 The apartments have large terraces planted with a variety of typical canarian plants. From this terraces you access a further terrace with spectacular panoramic views to Puerto Calero and the island Fuerteventura, you also have acces to the sumptuously planted large garden via a natural stone tunnel. In the middle of the 5000 sqm garden surounded with lava stone walls, the Swimming pool is integrated, this terrace offers you a breathtaking view to Puerto del Carmen, Puerto Calero and over the Atlantic to Fuerteventura. 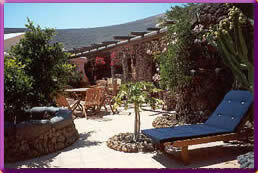 With dedication to detail many lava stones were used to built these holidays apartment and studio. They were also established with complex timber ceilings and soils. DVD Player, Safe, high-quality wooden terrace furniture. A washing machine is available in a separate room. 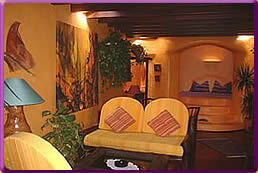 Many carpets, plants and large island-typical pictures provide a cosy atmosphere. Towels are available in sufficient quantity. When desired weekly intermediate cleaning.